I am looking on replacing my current '09 Chevy Malibu with something that can hold the family, but that isn't just a minivan or something of that nature. I will be using this mostly to commute to and from work. Thus, something reliable lower maintenance and with a decent stereo systems (I might replace the current stereo with my own Pioneer that works really well, eventhough it is a few years old now.) is preferable. Anywhow, what do you recommend? BTW, before this, I had an '05 Ford Freestyle which was perfect. Great sound, held everyone, and got good gas mileage. Repairs were minimal. At that price, mileage, and age Toyota and Honda are out. However, if you are lucky, you might find a Mazda 6 in your price range and within four years ago. In my area, there is one 2015 for $11,495 with 65,000 miles which is slightly over your range but it is a pretty reliable option if you can find one for about that. Another car that may work just barely is the Ford Taurus from 2016. it will be near the top of your price range and around 50,000 to 60,000. That is another possiblity that may work for you. If you liked your current Chevy and it was reliable enough then another Malibu may work for you. Chevy is not quite as reliable as the Buick but it is an okay car. A 2016 at 50,000 miles and under $12,000 should not be too much of a problem. A website you can use that is the best for searching for used cars is called www.autotempest.com. It searches all the car sites in your area and gives you a consolidated list from all the national car sites. This includes ebay, Cars.com, craigslist, you name it. It is a realatively new site that is excellent for searcing. Best of luck, let us know what you decide on. Not my area of expertise but I notice that Johnathan says he wants 7 passenger seating. If that is not a typo, non mini-van vehicle the choices are really limited. Of all the good cars AcuraT suggests, only the Ford Taurus can seat seven. Ford Flex also would fit the bill. Both are reasonable rigs but don't rank especially high in reliablity. Otherwise, to my knowledge, one has to look at an SUV or minivan. As has often been said on this forum, minivans are a marvel of passenger hauling efficency with comfort, cargo space, and fuel economy generally superior to SUVs. Given price range, a good Nav / Audio system not likely to be part of the package and an aftermarket unit is likely to be better than any factory unit that is 3-4 years old. Good luck Johnathan, would love to hear what you find out there. How much space do you need behind the third row? We still have a Ford Taurus X, and one thing I like about the Ford crossovers (Taurus X, Flex, Explorer) is that they have a deep well behind the third row so they can carry more luggage than most back there. Your choices will be limited by that combination of age and price. A quick search suggests that three-row vehicles that meet these cutoffs might be limited to the Dodge Journey, Mitsubishi Outlander, Nissan Rogue, and Kia Sorento. 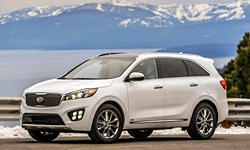 Of these the Sorento has the most space and drives the best, but it's not an outstanding vehicle in any particular way. Otherwise it would cost more. The Nissan Rogue will get the best fuel economy, but it's third row is very tight and has even less space behind it than the Kia's. I very much appreciate the replies! I did look at the Ford Taurus X, but see it isn't being made anymore, which automatically means an older vehicle. Ditto with the Flex. I would be OK with that, except the mileage would be higher. One that I do have on my list to look out for was the 2017 Ford Explorer. Still keeping an eye out. The Hyundai Santa Fe is a good choice, though the 3rd row might be a little tight. The Santa Fe is the best car mentioned so far. The Kia Sorento is a good one, too, but the 3rd row is almost useless. The Flex is good. It isn't too reliable though. It is more of a wagon, but it comes close to having minivan-levels of space. 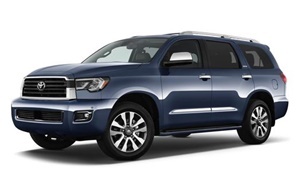 If you want to go back to the $12k budget, I'd get a Toyota Sequoia. There are more reliable and modern options than an Explorer. Since you are carrying your family in it and you are looking for newer cars now, you should get the active safety features like automatic braking, lane keeping assist, and blind spot monitoring. The 2017 Highlander has this standard on all trims (not blind spot monitoring). If that Santa Fe you are looking at is fully loaded, it has these features. Minivans have several features not found on SUVs that make them more practical than SUVs. The minivan is really the best option. I recommend leather seats in the car if you are hauling your family often. Really, the best way to find the car you are looking for is to see what is the best listing online without looking for a specific car. CarFax and other maintenance records foreshadow the car's problems down the road. At the budget and mileage you said you wanted, finding a specific brand and model is almost impossible unless you are lucky. Do you have a link to the listing of that Santa Fe? That is a great price that makes it seem as if it has a salvage title. I donyd doubt that a minivan would be best for comfort, we actually already have a 2016 Dodge Grand Caravan. I was hoping to get something a little smaller with more features. This is really going to be a commuter vehicle for myself to and from work, but being able to haul everyone would be nice. Ok, so I was originally basing on what I was looking for on what I could currently find locally and doing research on that vehicle... I know, limited thinking. My thought was I should be able to find something local. But, honestly, if it's a great deal, I'll inter-state to get one. Those are not in any particular order, with the exception of the first two entries. I know y'all have already mentioned some, just expanding my search area (literally). The first two are quite reliable, and I like that you are looking more broadly now. Some years the Honda Pilot is less than reliable with the transmission but generally a good car (although I won't buy them anymore as I have had transmission problems with two back to back Hondas even when they were supposedly reliable). Ford Explorer is not as reliable as the others listed. Kia Sorrento is the "corporate cousin" of the Hyundai Santa Fe. The two companies are separate but merged their engineering departments many years ago, so they share the same platforms but build different cars on them. These two you are considering are very close in nature. So the better price between the two may drive your decision on it and it won't make much difference. However, depending what is more important to you, you can choose between the two (it shows the pluses and minuses of each catagory of the cars 1 on 1, and both win about half of the catagories each - although the Kia wins the overall just barely). According to the CarFax associated with that car you selected, it was a rental car for two years - so the "one owner" was a car rental company. Car rentals by rule are driven pretty hard, and this has 45,000 miles on it. It is why the price is somewhat discounted. They know rental cars are less deseriable, so you are getting a break on the price. You might be able to get even more off when negotiating (especially if it has been sitting). The question is do you feel lucky? It probably has more wear than the average car with 45,000, but being South Korean it could still be fairly reliable for another 50,000 miles or so. Just be aware that you may experience wear on some items early. Some things that could wear early include the interior of the vehcile (more getitng in an out of by an assortment of people who may be eating or whatever in the car). the controls can be worn, the carpeting can be worn - but these are things you can check when you look at the car. I would see if any repair records have been kept. The transmission may wear early if the engine was "floored" a lot by renters. It just depends on who rented it and how it was treated. As long as you are aware of the risks it is a decent car from what I can read on it. Good luck. The Santa Fe is larger inside than the Sorento. It's just also usually more expensive. They had some minor problems the first few model years, but 2017 was well into the run. As for the car in question being a rental, just be sure you carefully inspect the interior for wear. Also check the wheels and tires--any signs it was run into curbs? My sense with rentals is that at least they're usually properly maintained. In my opinion, the fact that rental cars have are often maintained well doesn't make up for the fact that they have been driven by (maybe) hundreds of people. The renters don't own the car, so they treat it as such. Many full throttle accelerations, eating in the car, doing other things in the car, etc. This Santa Fe was in a minor accident, by the way. 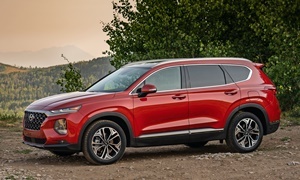 If you decide on this one, I'd get a pre-purchase inspection by a trusted mechanic, not by the dealer you are buying it from.Here is a Santa Fe that was not a rental. Was in a minor accident as well. I like the 2016 and newer Sorentos more than the 2013 and newer Santa Fes because Kia usually perfects the mistakes they produced with the Hyundai counterpart. Also, the Sorento is a little nicer to drive. On the other hand, the deal breaker could be that the Sorento is considerably smaller than the Santa Fe. The unreliable years of the Pilot were 2003-2005 because of the transmission. Also keep in mind that midsized 3 row SUVs get the same gas mileage as minivans. A lot of the listings in your area are rental cars. Avoid the Dodges and Nissans. Honda Pilot- High mileage, but great SUV overall. Has a reliable 6 speed trans. Was rear-ended however. Honda Odyssey- Really good deal. Leather seats. A lot more features than the Santa Fe you are looking at. Has lane departure warning, a refrigerated cooling box, power trunk, and tri-zone climate control. Has a little bit of damage to the door and front bumper in the last two pics. Ditto from mkaresh, I'm really liking this, lots of good info. 3. I've also added to see about the transmission. I'm betting that if you drive it for a bit and see how the vehicle responds to gear changes, smooth acceleration, has good alignment (could help indicate damage due to curb hits, etc. ), how smooth it accelerates and drives on the highway, etc. Basically general operation. Anything else I should look into if it is a rental? I would imagine that if it had been maintained properly, that it would be a bonus even if it was a rental. But, I get it, you don't know who drove it and more importantly, how they drove. I actually put together a large checklist of over 20 things you can check when buying a used car, but when I put it on here the formatting was horrible. Michael Karesh, did you ever figure out how to post it so it was readable? I can post it again but it really does not transcribe well. I came acrossthison Reddit a while ago. It is perhaps too extensive, so you might want to pay attention to only the deal-breakers. This list is more for if you are trying to buy a reliable $2k car. I think I remember AcuraT's list was better. Here is another question for ya... General maintenance costs... Are they that much higher than domestic cars? For instance: to changes, parts, etc. AcuraT: I don't think we ever fixed what was causing the issue. If you email it to me I could put it in a blog post crediting you (however you want to be credited), and you could then link to it. Would this work? Maintenance costs depend on whether you go to the dealer or an independent shop to get it maintained. The independent shop is typically cheaper and they don't try to scam you (though that depends). As far as brands go, Hyundai and Kia are similar to the domestics with maintenance costs. The repair frequency, however, is different. Hyundais and Kias usually break down less than domestic brands and are more reliable. Really, most mainstream (non-luxury) brands have the same maintenance costs (to repair or change a specific part). Michael, I will see about emailing it to you. Thank you. Regarding maintenance, it truly depends on the place you service it, a dealer or an independent shop you trust and as Lectrofuel said, the independent will be cheaper. Now as far as brands go, the best way to compare cost of maintenance is to look at the different brands at dealers to get the rates. For example, when I went to a Volvo dealer, the average maintainance when I look at it was $600 for a major maintenance check (every 30,000 miles) and $200 for the minor service intervals (every 6000 miles if you follow it). For GM it was $60 for a level 1 service, $120 for a level 2 service (alternatiing services each service visit, or every 5000 miles on average as they go by their "oil life" management software - which I used on my old Saab 9-3 changing the oil every 6000 or so, and the engine was still fine at 178,000 when a tree fell on it). Rotating the tires they generally charge $20. For Toyota it was $50 for the oil change, and another $50 for the tire rotation, or $100 per maintenance. For Kia it is around $130 for an oil change (ranges from $102 to $141, includes tire rotation) and around $350 for a tune up ($278 to $422). As you can see from the above, they all cost in a range around each other at the dealers (did this last April when looking for a new car with the tree falling on mine). Except for Volvo, the others are very similar. BMW was worse than Volvo, as was Lexus. The more expensive the car (even from the same company like Toyota and Lexus), the most it will cost to maintain it. Just the rule of the industry. Generally speaking, domestics are a little less as the GM rates proved to me, but my five year old Subaru is very expensive at the dealer so I use an independent mechanic I have trusted for 9 years now that keeps mainteance down for that car. As for tire rotation, balance, and alignments, I take the vehicle in once to Hibdon Tires Plus and pay for their lifetime service, like an extra $60 or so for tire balance and rogation, and another $60 for alignments. After that, I can get it done anytime, and it is paid for. I have car buddies that I throw qurstions and, at times, we look at it together. I can do most of the maintenance myself, with the help of YouTube, of course, just to make sure I don't miss anything. I should find me a mechanic though. Could it just be priced that way for the fact that it was a rental? It might be priced that way as a rental - it has nearly 18,000 miles in one year. I do note that the Carfax mentions two services, but neither was an oil change. It does not mean it did not have one, but I would find if there is a record of an oil change. If not, I would demand you take it to a mechanic so the valve cover can be taken off and you can check if there is any engine sludge. If there is, walk away as fast as you can. It means the oil was never changed and the engine is working with sludge. That is the best advice I can offer. If they won't let you take it to a mechanic to check that engine in that manner, walk away. You don't want engine sludge on an engine that new. It won't last you very long before you have engine problems. I tell you this from my work on my own engines when I was younger (when I bought used cars before I put my list together) - you don't want that headache. Michael - I will email today. Sorry, been crazy busy these last few days. Lectrofuel, good advice, but the car in that link is not a rental company - it is a used car lot they sold it to. Why I wrote what I did. But you are right about rental companies if you buy directly from them - they usually do allow that.